Whether you are new to task management or you’ve fallen off the wagon a few times, this podcast is for you. Once a week, Jean and James review their progress toward a more organized (and less stressful) way of life, and talk about highlights, challenges, and questions. Sometimes they ask the experts to chime in. But the focus will always be on how two friends, who not productivity gurus, ﬁgure out how to make this system work for them longterm. The podcast is short because we have things to get done! We’d love to hear your questions, comments and tips! 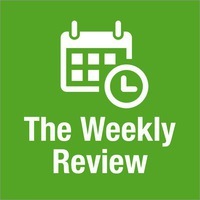 Email us at sayhello@theweeklyreview.fm. James Dempsey is a fifteen-year Apple veteran gone indie. At Apple, he was an evangelist, technical trainer, curriculum manager, and software engineer, working on Aperture, iOS, and macOS releases Leopard through Lion. Since then, James has has lent his engineering expertise to a variety of Silicon Valley startups and become a sought-after conference speaker and trainer. He is also the frontman of James Dempsey and the Breakpoints, a band that performs humorous original songs about technical topics. Their debut album Backtrace topped the iTunes comedy charts in the US, UK, and Canada, and reached #5 on the Billboard comedy album chart. He blogs at jamesdempsey.net. You can also find him on Twitter and Micro.blog at @jamesdempsey. Jean MacDonald has worked in indie software and web publishing since 1996. She worked as a freelance web designer and marketing specialist, as well as a teacher of web design and digital graphics creation at the Pacific Northwest College of Art. She joined Smile Software in 2004 and worked as the marketing and public relations manager for 10 years and became a huge fan of podcasts. She founded App Camp For Girls, a non-profit dedicated to promoting gender equality in the tech industry. Currently, she works at Micro.blog, an independent blogging and social network alternative. She hosts the Orphan Black podcast SestraCast on The Incomparable network and she produces a weekly microcast, Micro Monday, highlighting members of the Micro.blog community. She is on Twitter and Micro.blog at @macgenie.